You probably know Murmur’s account director, the unflappable Mary Nichols. If you don’t, you probably will soon. That’s how Mary works. She’s a marketing and networking powerhouse and that’s exactly what the judges thought at the American Marketing Association’s MAX Awards. 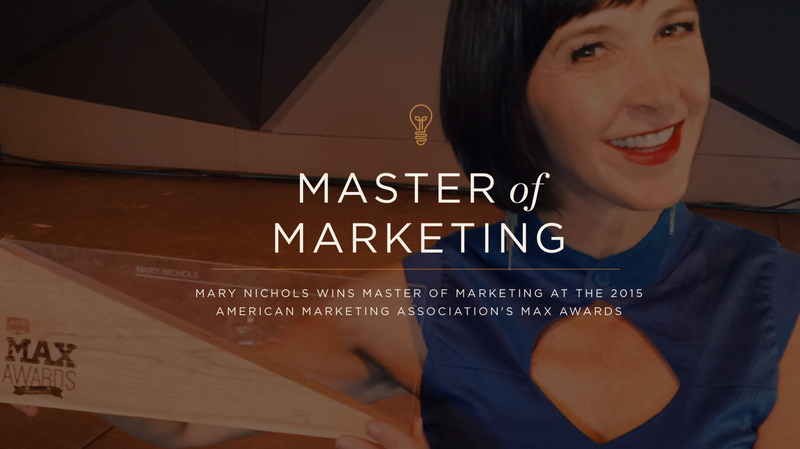 We’re proud to announce that Mary Nichols won the 2015 “Master of Marketing” Award at the MAX Awards. A panel of judges chose the nominee they felt exemplified marketing at the highest level. Mary has branding and marketing in her DNA. Mary’s father was an executive at the largest privately held advertising agency in the world. She’ll be the first to tell you, she lived in the world of the real “Mad Men.” Hear her story in this video. After earning undergraduate and graduate degrees in marketing, Mary put her talents and energy to use at Celestial Seasonings Tea Company, promoting buzz-free beverages before moving on to Coors Brewing Company to market buzz-filled beverages. After successfully completing two tours of duty in traditional corporate marketing, Mary applied her skills to the emerging landscape of grassroots digital marketing and started Karmic Marketing, a consulting firm specializing in developing and executing customized social networking strategies. Mary is a champion of local business and social justice. With no previous political experience, she ran the successful social media campaign for Portland Mayor Charlie Hales, and this year year was honored to be chosen as one of the Portland 10, a group of ten people Prichard Communications believes to be current and future change makers of our city. Mary has taught marketing at the University of Colorado and the Pacific Northwest College of Art. She sits on the board of Portland Social Media Club, participates in promotion and fundraising for Street Roots, Planned Parenthood, and the Human Rights Campaign for Marriage Equality. As Murmur Creative Account Director, Mary is responsible for establishing, maintaining and growing effective and profitable client relationships resulting in continued new business and creative opportunities for the agency. Mary is an avid yogi, bike commuter, seasoned traveler, and, as a mother of six kids, a regular at Costco. Basically, she’s the world’s most powerful wizard and having her on your team is straight up Fantasia. If you see Mary (and you will) be sure to say congrats!